It is times like this that I really wish the internet had a scratch and sniff option. 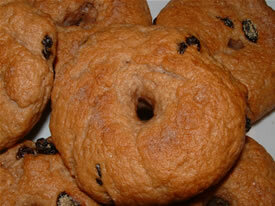 I have just finished whipping up a delicious batch of gluten free bagels. The house smells amazing and not too far off from the bagel stores that peppered that the streets of the place I grew up. I think I can finally say that I am on my way to mastering the making of these wonderful wholly discs of dough. Crisp on the outside warm and chewy on the inside. Anyone who knows me well knows that it is the bagel that I grieved most over upon my diagnosis of celiac disease. In fact a year ago I literally broke into tears when my father arrived Christmas morning with a big piping hot bag of bagels. I stood on the sidelines with my sad bowl of Gorilla Munch while the rest of the family devoured the luscious gluten laden bundles of joy. Over the past three years I have been plagued by nightmares where I can not resist a salty bagel schmeared with vegetable cream cheese. Perhaps it is not so much a nightmare as a fantasy but it always ends the same way…with me waking up and realizing that, sadly, it was only a dream. After having about three of these dreams in one week I decided enough was enough and that it was time for me to try and conquer the making of the bagel. With Google and a creative array of keywords by my side, I set out on my quest to find the perfect bagel recipe. Fearlessly I hunted through a plethora of recipes claiming to be for bagels when really they were just recipes for doughnuts or bread in the disguise of the highly regarded bagel. To be avoided at all costs were recipes containing blasphemous ingredients such as butter, oil or worse yet the dreaded shortening. After several tiresome runs I was on the brink of throwing in the towel…when all of the sudden there it was! The most magnificent bagel recipe I had ever seen. I could barely believe what my eyes were blessed with reading. It was a recipe for “Real Honest Jewish Purist’s Bagels”. It was as though I had unlocked a secret trove in the sacred heart of Israel. This recipe is absolutely fantastic but I must warn you that it is rather complex and will require a good amount of patience and probably a few attempts before you will be able to claim total victory. Don’t get me wrong, your first batch will taste just fine but they may lack in the department of bagel aesthetics. The dough itself will not be as smooth as gluten based dough so these bagels will have a slightly lumpy appearance. The key really is learning how to form the bagels…which I am afraid only practice will perfect. I wish you luck and hope that your path to gluten free bagels is paved with golden lox and cream cheese.